Absolutely loved the encounter! I would recommend that over the swim by far! SO much hands on with the dolphin. We also really enjoyed the wrestling show that was in a restaurant/ bar nearby. Souvenirs were ridiculously high. Very fun, we loved the dolphins and our instructor was very funny and knowledgeable of the animals. We enjoyed learning hand signals to get the dolphins to interact with us. Amazing experience!! Worth the money just to interact with these gentle beautiful creatures So much fun!!! Do the push and pull excursion. Simply amazing, an experience we&apos;ll never forget. Simply amazing, an experience we&apos;ll never forget. Loved Costa Maya, hated the pricey food and drinks from the vendors. Their main objective was to take your pictures only to try to sell them to you at excessively high prices. You are not allowed to take any photos on your own. We LOVED this! This was by far our favorite thing! The dolphins were so smart and gentle. The trainer did a very good job with our kids and the animals. The entire experience was so much fun and something we will all remember forever. dolphin encounter, nice experience, well run. Wife did this excursion since I am handicapped and couldn&apos;t do it. My husband swam with the dolphin and I did the encounter. My husband swam with the dolphin and I did the encounter. We both had fun and the dolphins will kiss you ! Short walk from the pier. Short walk from the pier. You are in groups of about 10. They provide lockers. Dolphins were entertaining. We got to do the kiss, shake, push on the boggie board and the swim. It was fun to do but I won&apos;t need to do it again. Got some great pics and got in water with dolphins and a cd of pics. Riding dolphins! Need I say more? Bring a ton of cash if you want to buy pictures. Crazy expensive so we did not purchase those. We will never forget it though! Staff with AotS and the dolphins were amazing! Excellent for small kids, perfect experience. Excellent for small kids, perfect experience. Highly recommend this! 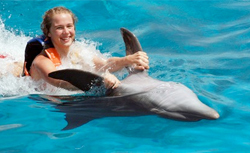 A MUST DO is the dolphin swim, where you are holding onto the dolphin and swimming belly to belly!